Home Latest News Vote for Cornwall! Visit Cornwall is appealing for support in its quest to be named the UK’s favourite holiday destination for a seventh successive year. Cornwall has held the accolade at the British Travel Awards since 2009. Voting is now open for the 2015 edition of the awards, and Visit Cornwall chief executive, Malcolm Bell, said: “It’s a tremendous feat to have six years under our belt but we never take the next year for granted. Bolstering Cornwall’s chances further in the British Travel Awards are the Eden Project and National Maritime Museum Cornwall, who are up for Best UK Leisure Attraction and Heritage Attraction respectively. Bude is also in the running for Best UK Coastal Resort. 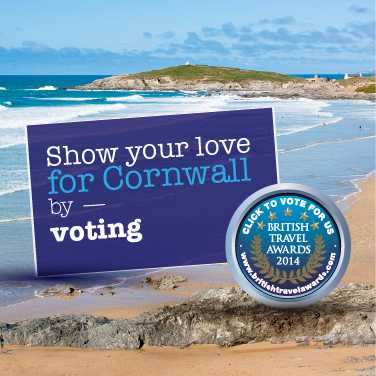 To cast your vote for Cornwall, click here. Closing date for voting is September 30.